I made hamburger and hotdog buns over the weekend, and thought I'd share my results. 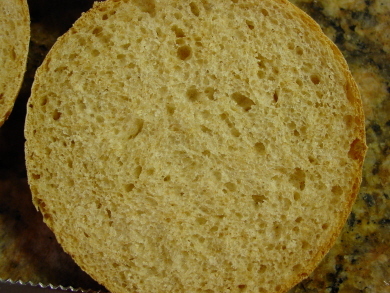 I used a soft, enriched, whole wheat sandwich bread recipe that has milk, egg, oil and a little honey. The formula is fairly ordinary for soft, fluffy bread, but the baking pan deserves a mention, so I thought I would post about it here. I actually have a hamburger bun pan, even if it always seems to be my last choice. When I'm making a full batch of 12 buns, I reach for a half-sheet pan. It's the perfect size for the buns to grow into each other just a little and support each other in the oven. I can see why you preferred the muffin top pan. Nice hamburger buns too :-) . Thanks for telling us about this neat pan. What is a Muffin Top? I looked it up on KA. It's intended use appears to be for making shallow muffins--less muffin, more topping. KA's brand is bigger than Chicago Metallic (bigger holes). Mini, are you a Seinfeld fan? Great video. Why do I feel like we were just sitting ducks waiting for you to post it? I really enjoyed it. It made my evening! Got anymore funny youtube stuff? Please send it my way. Funny. Thanks. So baking muffins tops with regular muffin pans can create problems? 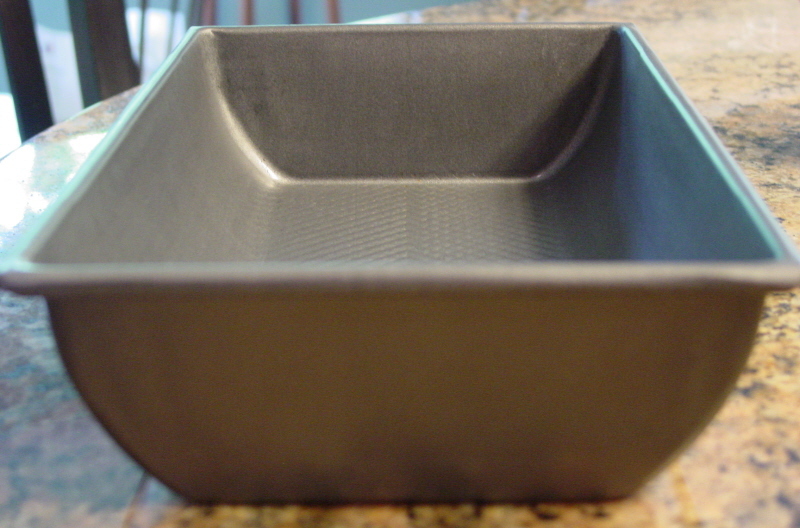 A muffin top pan is a solution to the problems of too many stumps? Cute. I'm speachless. Thoughts: Cake like cookies... no bottom crust wanted (papers?)... grease and line pan with flavor... top rack. So smooth they look like eggs! Beautiful! I can see why the left pan works better. The pans also provides more bottom surface area, so more bottom & side heat too. I have the problem when the dough rolls or slips, or parchment buckles going into the oven and two or more stick together. Especially in a small oven. I do tend to over-crowd the pan. Thanks for sharing. Could the second pan, the deeper one, be a tart pan? I've seen shallow tart papers about that size. I have the KAF Hamburger pan (made by Chicago Metallic) and like it very well. In fact, I got a second one so I could make 12 buns at a time. 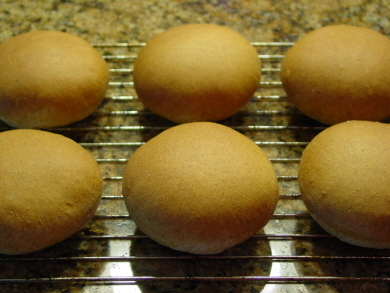 I have made many hamburger buns using dough with, milk (powder), butter, and dark brown sugar. Makes great buns. Then one day when making my Italian dough that I use for both pizza and bread I decided to try making hamburger buns with that too. They turned out great and I now use both doughs. 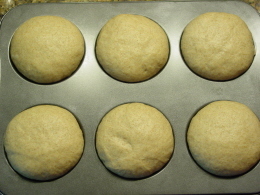 My spouse prefers the Italian dough – I use about 75 grams for each bun. I scaled these at 2 1/2 oz, which is pretty close to your 75 grams :-) This batch was 50/50 white and whole wheat---I'm working toward 100% whole grain. 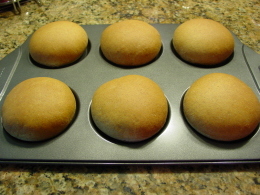 Those pans do make perfect looking buns! I saw the hamburger one when I was ordering my giant Texas size muffin pan. My husband loves those big muffins. I bet either of those pans would work nicely for tarts to as Mini suggested! That was funny Debra. Great Buns! 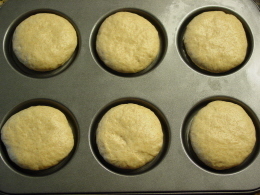 Can you make muffin tops in the hamburger bun pan? I too, was perplexed at the similar qualities of both pans. Is there a chance they have them mixed up? They're more similar than I thought. 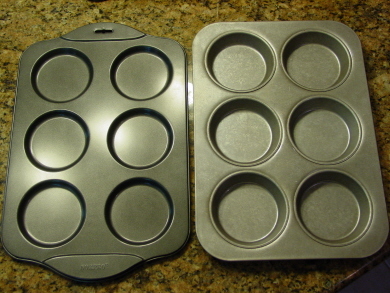 But, the bun pan is twice the depth (1") of the muffin pan (1/2"). That's really the only difference on the dimensions. And the bun pan is a heavy steel-aluminum. I guess you could use the bun pans for tops, but they may be more like small cakes. I imagine they would probably have a thicker, tougher bottom crust because of the weight and type of metal. Don't know that for sure. Where is the picture of the hot dog buns?? I have made hamburger buns for years and never used a special pan. Guess I am lucky!! But I haven't had the courage to try the hot dog buns yet.....PLEASE post the picture of them too!!! Debra...thanks SO much for the link! THEY ARE BEAUTIFUL!! You used a cookie sheet for these?? As much as I love special pans, I agree with some who love things in the kitchen that multi task, plus the fact of just being able to put something to many uses!! I will try to make them for the 4th!! I am INSPIRED NOW!!!! The Pan looks really close to my Biscotti Pan... what are the dimensions of yours? Thanks for the tip :-) The pan is 11 1/2 inches long by approximately 6 inches wide. But the sides curve out from 4 inches across the bottom to 6 1/2 inches across the top opening. It's the Hearth Bread Pan (for rye breads). Now that you posted the photo and mentioned that this was the pan KAF sold for rye breads, I realize that's the pan I bought, used once and stashed! I found I didn't like it for rye breads, but now I will try it for rolls! I don't like spending money on stuff I never use. Could also be a rectangular flatbottomed wok? I just bought a deep medium size (24cm) frying pan (more like a flat bottomed wok) with a nice bottom curve and removed the handle. It's dark outside and non-stick inside perfect support for my high hydration "rye rounds." The low hydration dough got so excited it went fluffy on me as I tried it out. Finished loaf weighed 1320g or 2.9lbs. I don't know that a rectangular pan is suitable for stir frying. Maybe shove frying. Japanese omelets? Hmmmm ... A "magic bowl" cover for a single demi-baguette! They just might work on some bread pans... 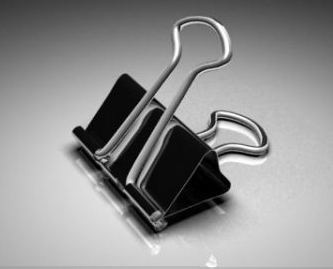 Introducing the new "bread clips" !!! thanks for the great tip on using a muffin top pan! !